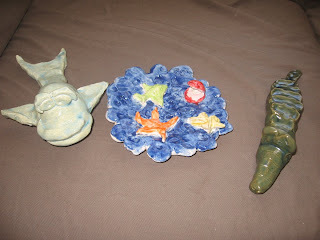 The Massaglia Family website: Pottery Class Results! We got the pottery back from pottery class this summer. Valerie created an alligator (no feet, I guess they ran out of time) a fish, and the sea bowl where she has a clam with pearl inside, a starfish, a seashell and some kind of fish. Scarlett also made an alligator, a fish and her sea bowl has a whale, a sail boat, a shark fin, and I don't know what the green thing is. 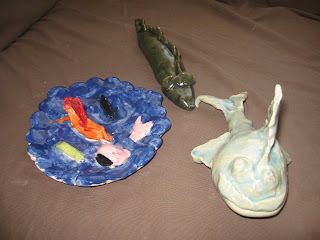 Ella didn't have time to make an alligator, but she made a fish and sea bowl. Her bowl has an octopus, a boat, and also something I don't know what is. 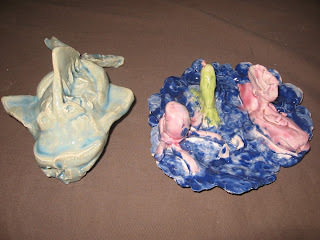 The teacher spent 2 classes letting them make the items, then the last class they glazed them. The only thing I didn't like about the class was it was over 20 minutes away in Highland. If she was right here in Orem, I would probably let them do classes all the time. Now all I need is a place to put all their creations. I'm thinking of making a high up shelf in their bedroom to display their treasures on without little hands being able to get into them.